At Open Heart Apothecary, each is crystal carefully selected for its particular energetic vibration and healing ability. We cleanse the crystals and charge them by the light of the moon. Our crystals are infused with healing Reiki energy, to amplify their purest healing powers. They come with a healing benefits information card when you order. The crystals we sell are not dyed or radiated, close to their raw and original form. Scientific evidence points to the fact that everything in the world has an energetic frequency. Albert Einstein even noted that "Everything in life is vibration." This includes our thoughts and perceptions about the world. Einstein said, "Everything that manifests in your life is there because it matches the vibration of your thoughts." Crystals are no exception to this phenomenon. They are amazing gifts born from the earth. They were formed millions and sometimes billions of years ago as trapped molecules under high pressure, caused by conditions such as volcanic activity and climate change. During this time, these molecules transformed into unique crystalline structures. All crystals that exist today were created during these ancient times. When unearthed, every crystal projects subtle, invisible vibrations that interact with your own energy fingerprint. What if we could use crystals as tools to help us grow and change? Gems have been revered by every culture for millennia in folklore and mythology for their beauty, value, and mysterious nature. The ancient Greeks used Amethyst to help promote sobriety and Citrine to help bring about abundance and wealth. Within the vast mineral kingdom, each crystalline structure has a signature effect that has been appreciated for hundreds of generations. Fast forward to modern day, where gems are more accessible than ever. With new scientific awareness and understanding we can continue to explore the value of these crystals as we search for a more meaningful and connected life. Quartz, which makes up 12% of our earth's crust, is highly valued for its piezoelectric and pyroelectric properties. It can transform mechanical pressure or heat into electromagnetic energy. Quartz’s ability to focus, amplify, store and transform energy is used throughout the technology world, in many devices from watches to microchips. 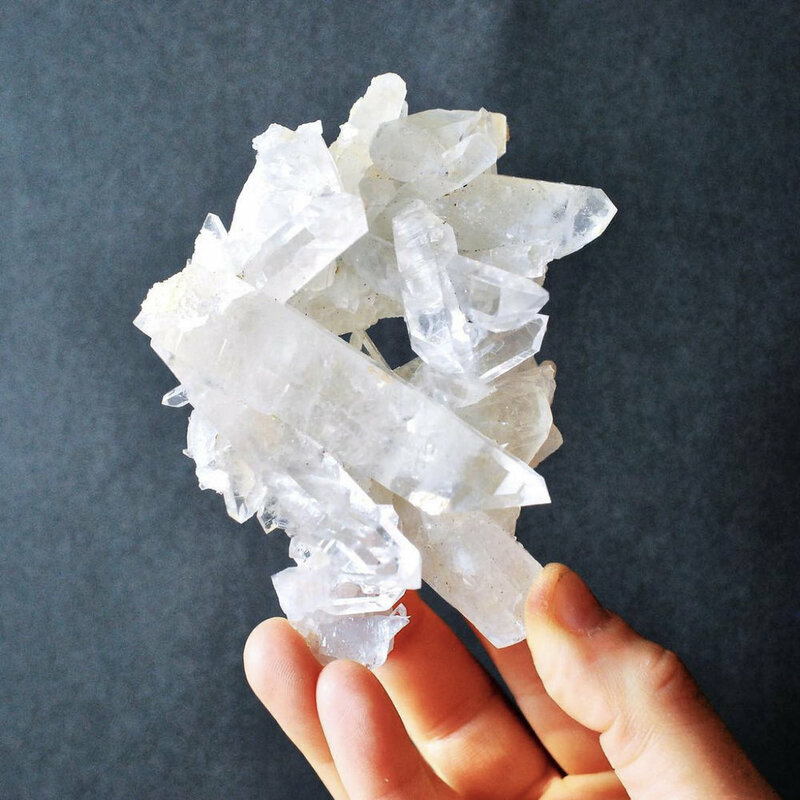 The same properties of energy amplification, programmability, and memory also make Clear Quartz a versatile stone for directing and transmuting your own energy for any desired purpose. 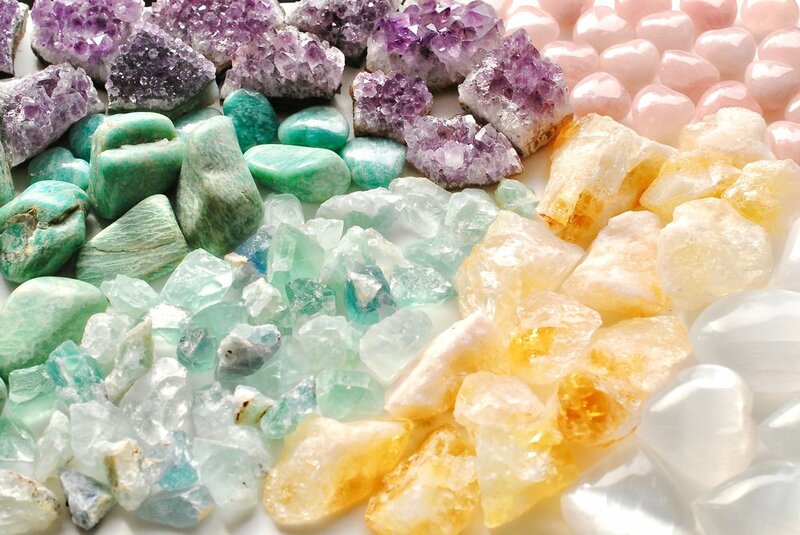 Beyond the science and technology, crystals encompass the entire spectrum of colors, textures, and luminosity. They invite you to stop and appreciate the beauty of this world. They are visual reminders to take a deep breath, and stay present, while at the same time inviting you to set an intention and goals for personal growth. Ultimately, crystals are wildly enchanting and vibrant and are a wonderful way to bring more magic in our ordinary lives. Sweet and calming Amethyst is an essential stone for every crystal collection. Excellent for spiritual seekers and curious beginners alike, Amethyst offers its harmonizing and centering qualities to everyone at all stages of their journey. It nurtures healthy emotions, helping to dispel anxiety, fear, doubt, and anger. Associated with the Third Eye Chakra, Amethyst awakens spiritual growth and psychic abilities. High-vibration Crystal Quartz contains the most powerful healing energy of all crystals. A natural prism, Crystal Quartz contains the entire color spectrum and provides ultimate protection, clarity, and focus. It amplifies the power of other crystals and can be programmed with specific intentions. Crystal Quartz activates all of the Chakras, especially the Crown Chakra, and increases psychic ability and spiritual connection. A master healer. Citrine is the stone of abundance, creativity, and manifestation. It stimulates the Solar Plexus Chakra, the seat of personal power and strength. Citrine helps to remove obstacles and allows luck, prosperity, and joy to flow in your direction. Wear Citrine close to your Solar Plexus to enhance these qualities. Citrine is an ideal stone for artists, healers, and those seeking more self-esteem and confidence. Black Tourmaline is a powerful bodyguard against negative and damaging energy. It protects and purifies, helping to dispel tension and stress while also inspiring optimism and practical creativity. Black Tourmaline balances the Root Chakra by promoting a feeling of safety and soothes self-doubt. Place Black Tourmaline on your body, in your pocket, or in your bedroom, office, or car to protect from negative energies (including radiation and EMFs) and provide a protective field as you move through challenging situations. Beloved stone of artists and thinkers, Fluorite stimulates the mind, expands creativity, and enhances mindfulness and organization. It is also a very spiritual stone that balances emotions and the psyche. Violet Fluorite purifies the mind and boosts intuition. Green Fluorite clears negative energy and promotes renewal. Blue Fluorite stimulates clear thinking and precise action. Clear Fluorite cleanses the aura and amplifies qualities of other crystals. Pyrite sparks creativity, confidence and lucky breakthroughs like no other stone. Pyrite draws high-vibration energy in the body and manifests it into action. It promotes mental clarity, creativity, will, and abundance. It is also highly protective, creating a defensive shield that deflects negative energy, environmental pollutants, physical danger and emotional harm. Place Pyrite in your home or office for a creative energy infusion. Master healer Kyanite quickly and powerfully clears energy blockages and balances the entire system. Its high vibration resonates with the Throat Chakra, encourages self-expression, courageous truth, and clear pathways of communication. Kyanite deflects negativity and confusion while stimulating the higher mind, making it a powerful stone for meditation and personal growth. Sacred Moonstone embodies the passion and beauty of the full moon. Moonstone represents the divine feminine and helps to soothe issues around the menstrual cycle, fertility, and pregnancy. Moonstone also activates the Crown Chakra, which governs intuition and psychic perception. It can be used to enhance goddess energy, emotional intelligence, and dream work. Gentle Rose Quartz is the ultimate crystal for nourishing unconditional love. A fine healing stone to mend emotional wounds and trauma, Rose Quartz allows the heart to open for deep inner healing and self-love. Use it to attract new love and promote peace and harmony in all of your relationships, including with yourself. Its gentle healing qualities make Rose Quartz a perfect stone for children and beginners. Named after the mythical moon goddess Selene, Selenite is a master healing stone that invites clarity of mind, tranquility, and deep healing. It activates the Crown Chakra and is used by healers and light workers to enhance spiritual growth and psychic communication. Selenite clears energy and negativity, reduces stress and anxiety, and promotes positive transformation. Amazonite inspires courage, compassion, and optimum health. Known as the Stone of Courage and the Stone of Truth, it resonates with the Throat Chakra and empowers one to speak and live with confidence. Amazonite opens a higher perspective of truth and intuition while imparting a feeling of calm balance and stability. It assists with trauma recovery and protects against negative thought patterns, EMFs, and radiation. Celestite is a high vibration stone that elevates consciousness and inspires higher learning. Known as the spiritual teacher’s stone, Celestite offers hope and divine guidance while also encouraging everyday mindfulness and peace. Derived from the Latin word for “heaven”, Celestite promotes purity of the heart and heals the aura. Place it the center of a room to raise its vibration and enhance spiritual awakening. Aragonite is a reliable stone for grounding, centering, and transforming stress into peace. Its strong earth qualities are supportive and comforting, allowing us to slow down and stabilize, especially when confronting uncertainties ahead. 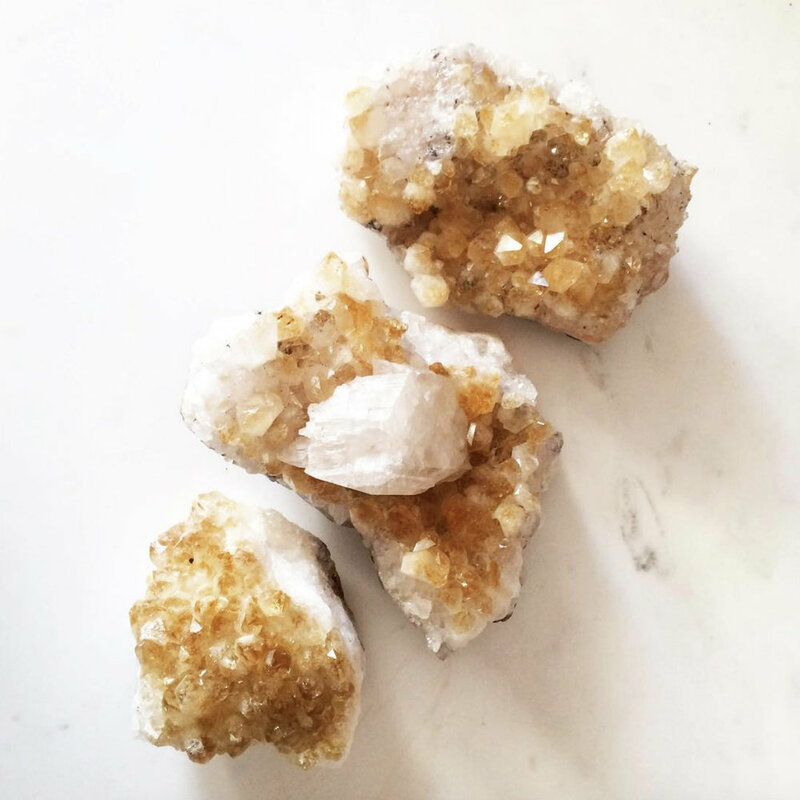 Aragonite enhances connections to nature, childhood, and the physical body. It also promotes strong and steady spiritual development. Calming Chrysocolla promotes peace, wisdom, and effective communication. It stimulates both the Throat and Heart Chakras, creating a pathway for compassionate expression and heartfelt teaching. It eases emotional stress and heartache, promoting a grounding and stable energy. Chrysocolla is a Goddess stone, reminding us that genuine power is best expressed through gentleness. Jasper is known as the “Supreme Nurturer,” offering a supportive, calming, and stabilizing energy, as well as protection from negativity, harmful thoughts, and obstacles. Jasper brings a sense of wholeness to your life and encourages patience, cooperation, and peace. Jasper is found all over the world in nearly every color. Each piece’s individual healing properties are linked to the dominant colors or “pictures” seen in its bands and patterns. cure medical ailments. They are not meant to take the place of standard medical or psychological treatment.